As you may already know, 2013 marks the one hundredth anniversary of The Art Bulletin, CAA’s first print publication and a preeminent scholarly journal for the history of art and visual studies. 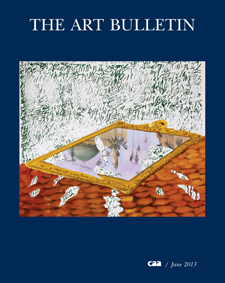 The Art Bulletin covers the full range of art history in essays by some of the world’s most acclaimed scholars of art. Essays from The Art Bulletin have been staples in art-history courses at colleges and universities for decades, and the journal continues to support exemplary scholarship in all areas of art history. In honor of this important anniversary, CAA invites you to make a contribution to the Art Bulletin Publication Fund. Contributions of $50 or more made before July 1, 2013, will be acknowledged with a special thank you in the September issue, and contributions of $250 or more will be acknowledged in four consecutive issues and on the CAA website for twelve months. Please join CAA in celebrating The Art Bulletin’s longstanding excellence as a leader in art-historical scholarship. We look forward to many years to come.